Whisper finishes scratching her face. 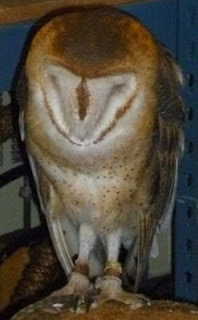 Whisper, TRC's education winged ambassador barn owl, is taking a nap right now. She woke briefly to scratch the side of her face. You can see her unique toe arrangement as she was putting her foot back down. 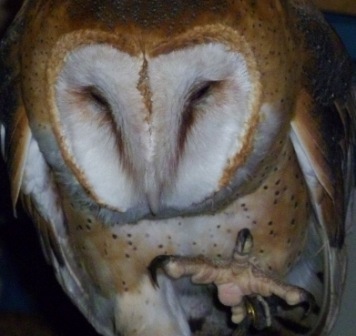 Most owls have a zygodactyl foot arrangement, which means that digits 2 and 3 point forward and digits 1 and 4 point to the rear. Whisper is lovely! Barn owls are my favorite owl. I like their heart-shaped faces and their feet.